Thank you to Thirkellgirl for caring enough to ask how things are going. My prolonged absence gives you the answer: not well. My 'mindful eating', CBT approach worked beautifully for several months (not just a few days or weeks). I shed around ten pounds between August and Christmas of last year. It remained static for the next few months, and then it was Eastertide again. What is it about Easter? No, it's not the eggs, before you ask! Maybe it's the fact that the run-up to Holy Week, in a clerical household, is obviously frantic; perhaps it's the collapse-on-holiday that follows it each year; but it must be something more, as looking back over nearly three decades of struggle, every single time that things have gone horribly wrong once more, it's always been then. I have "got it sorted" with food, exercise, self-esteem and the rest; the effects have lasted anything from six months to two years; but the point of collapse has, somehow, always been that wretched moveable feast. This year, we completed directing a show (wonderful, successful, a joy to work on) at our local theatre, at the end of February - but I jumped straight into rehearsing (or nearly immediately) for another one. My business activities (happily) moved up a gear. I travelled around the country, for business and pleasure. I didn't make it to the gym once in literally months. Even my regular walks-around-the-village ceased. Busy, busy, busy; excuses, excuses, excuses. 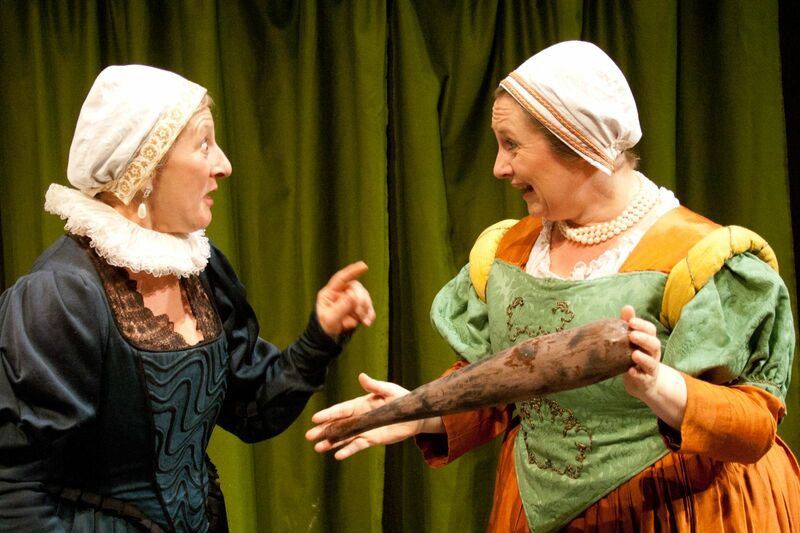 Tomorrow is the final performance of the present show (The Merry Wives of Windsor). I've been playing Mistress Page: lovely show, great part, excellent cast, huge fun. However, I have to 'fess up and say that it's been the worst time possible for self-image. Tudor costume is not kind to many of us (a bum roll? Somebody of my figure does NOT need extra girth added...); and, because one is limited to what is available in the company's wardrobe, I've ended up in a costume that I hate. The colour, the fit, are all totally wrong. The wardrobe ladies have done their best, but they are working with unpromising material. It doesn't help that I'm back to my largest size, my nearly-a-sixteen once more; but in this get-up I look more like a twenty. When I comment on Falstaff's size ("There's no woman's gown big enough for him", the audience invariably laughs, and I am quite certain it's because they are thinking "well, yours is"). To be fair to myself, the front of the dress sits at least a couple of inches proud of my body, which makes me look even more enormous. So I've spent the last couple of weeks making people laugh while I wander round the stage looking like a barge in full sail. I try to wear something more flattering to change into when I see my friends after the performance, but even that is a tough call at the moment, given the general flabbiness. My face (always the first place to show weight) is moon-like, and this is not helped by the Elizabethan requirement for hair-under-hat for married women; having a small head on a large body is even more unflattering. All this puts me in the worst possible place. It should drive and motivate me to improvement, but right now I am so tired and defeated, and worn out by the effort of continually playing (a) the clown as my part requires, and (b) the strong woman as my life requires, that I can't find the strength. Once the show comes down tomorrow, I have a few days to catch up; then a week with beloved friends visiting us; then a week's blessed break in a little self-catering place in Normandy. Finally, time to stop and think. And focus on myself once more. I hope that, after that, I can respond to Thirkellgirl's kind enquiry "How's it going?" with "Brilliant, thank you". Oh, thanks for posting! You know, I've gone from 128 pounds six years ago to 182 six months ago, and up and down several times in between. Deaths, illnesses, bad attitudes, good attitudes, you name it, have contributed to my vacillations. I had a YEAR of plantar fasciitis (that doesn't look spelled correctly...). At this particular time, I'm "on the wagon" well and truly and have lost 18 pounds in the past six months. I'm walking and running four or five times a week. I hope I stay this weight and lose another ten or fifteen pounds, but my main goal at the moment is to incorporate regular vigorous exercise and healthy eating habits into my life long-term. Don't be hard on yourself, you can only do what you can do, and as you haev mentioned that changes with the seasons. Thanks for updating!